The first and only other time Sue and I visited France was in 1995, with our teen-aged son and daughter. We stayed in Paris for a few days, then toured the villages of central France, spending a day or two in each location before finally returning to Paris for the flight home. For our trip this year, we decided to adopt a more relaxed pace and cut back on the travel: we would spend one week in south-central France and one week in Paris. I learned two things from our 1995 trip: our first day in Europe, we were so tired that we could not do much else than recover from our near-zombie state; and our last day in Europe was spent mostly on the road, heading back to Paris — we stayed overnight near the airport so we could more easily catch the morning flight home. Looking back, it seemed to me that we could have more hours of fun this time around if we juggled the itinerary. This is where Bordeaux comes in. On Bordeaux, travel guru Rick Steves imparts this bit of wisdom: “Bordeaux must mean boredom in some ancient language. If I were offered a free trip to that town, I’d stay home and clean the fridge.” Nonetheless, I thought it made sense for us to head to Bordeaux for the first couple of days of our trip. First, this would front-load most of the tedious travel. We could take a train directly from Charles de Gaulle airport to Bordeaux — and maybe sleep a little on the train. We would arrive in Bordeaux right at hotel check-in time so we could rest before dinner. Our second day in Bordeaux could be low-key — see some shops, visit the art museum, adjust to the time difference. Finally, on our third day, we could pick up our rental car and head to St. Emilion and Sarlat to start our more purposeful sightseeing. On the tail end, spending our second week in Paris — rather than the first — would allow us to fully enjoy our final day in France. We could simply hop on the RER train or get a shuttle from our hotel to the airport the morning of our return flight. All this reinforced my decision to head south to Bordeaux to begin our trip. I looked at other waypoints besides Bordeaux that were closer to Sarlat, such as Périgueux and Brive-la-Gaillarde, but the train schedules were uncooperative. Traveling by train to Brive from the Paris airport involves two transfers, and we would not have arrived in Brive until 5:30 pm, more than 10 hours after our plane touched down. That’s too much. So what did we do in Bordeaux? Not a lot. We skipped the museum, as we were still too tired to appreciate art. We did a little gift shopping, and I strolled around the old city with my camera for an hour or so while Sue was taking a nap. We had pre-dinner drinks both nights at a bar near Place Gambetta called The Central Pub. It was very popular with young chain-smokers and drinkers. And we very much enjoyed our meals at Le Grand Café, just a few steps from the Hôtel la Tour Intendance, where we stayed. The hotel — ehh — the front desk was very friendly, but the room was cramped and there was no ventilation unless we opened our door. I thought it was way overpriced for $180 a night. Would I go out of my way to visit Bordeaux again? Even though we didn’t see much of it, probably not. We had some nice meals, but that isn’t unusual in France. Bordeaux served the purpose I intended, which was to let us get adjusted. If I were in this area again, I would want to be closer to the ocean — somewhere like Cap Ferret, about an hour west, where one can enjoy beaches and fresh seafood. At this point, you must be thinking, this was a pretty long blog post about getting some rest and having a few good meals in a town we really didn’t explore. So it is. C’est la vie. There were two small hiccups in our travels through France, both metro-related. We picked up a rental car in Bordeaux so we could explore the towns and villages in the Dordogne valley during our stay in Sarlat. Then we drove to Paris to return the car and start the big-city part of our vacation. The vehicle return location in Paris was a hard-to-spot parking garage entrance near the Montparnasse railway station. We had to circle the block twice to find it but finally did, and we approached the Europcar office a few minutes after 8pm. I thought we were in good shape, since the website said this location was open until 10pm. That was before we saw a man locking the door at the Europcar office and starting to walk away, just as we arrived. Luckily for us, we were able to stop him and ask, what are we supposed to do with this car? Had we pulled up just a minute later, we would have never known that (a) this parking-garage return location closed at 8pm, (b) it was the Europcar office inside the train station that was open until 10pm, and (c) if there was no one in this office, we were supposed to park the car, lock it, then drop the keys into a little hole in the top of a poorly-marked box next to the dimly-lit office. Needless to say, none of this was spelled out on the Europcar website or mentioned by the rental agent in Bordeaux. The man who had just locked up the Europcar office was incredibly friendly and helpful. He told us where we should park, he looked over the car for ten seconds to make sure it wasn’t damaged, he told us what to do with the keys, and he stayed with us until we had unpacked our luggage from the car, even though by now it was a good twenty minutes after his closing time. Whoever said Parisians aren’t friendly to Americans? But that is only Chapter One of this adventure. While waiting for the elevator in the parking garage, we exchanged pleasantries with a man in a suit and tie, and Sue asked him how we might get to the metro. He suggested we follow him, as he would be taking the same line as the one that would take us to our hotel, and he said his way to the station would be shorter. Sue and I proceeded to lug our suitcases over the streets and through the crowds around Montparnasse, following the path forged by the kind Parisian (who, I must say, bore some resemblance to Gus Fring from Breaking Bad) for what seemed like half a mile, until we finally arrived at the station for Metro Line 4. 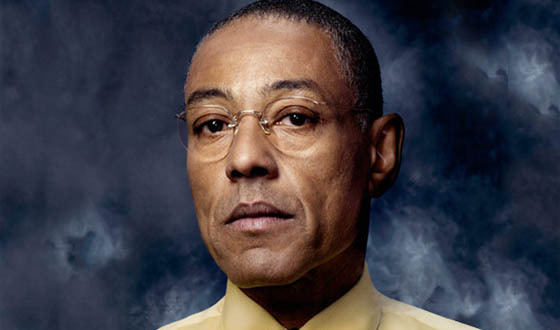 Gus Fring offered to take Sue’s suitcase down the Metro stairs, while I struggled alone. Then there we were, finally, in the Metro, with our luggage, and now all we had to do is figure out how to buy tickets and get on the thing. Gus Fring helped again and showed us how to operate the ticket machine before we exchanged our parting pleasantries and business cards and went our respective ways. We didn’t even make it past the first turnstile before we had another problem. As Sue was pulling her suitcase through the swinging doors just beyond the turnstile, the doors closed and clamped onto her suitcase – we couldn’t pull the suitcase through and I couldn’t pry the doors open. After a minute of struggle, Sue had the idea to put my own ticket in the turnstile to release the doors. This worked, to the relief of the people waiting behind us. Beyond the metro turnstile, we were to encounter four more sets of stairways, some of which must have had 30 or more steps. So I formulated a strategy: I would take my suitcase partway up the steps, leave it there in sight of Sue, then go back down to retrieve her bag and lug it up, repeating this process until done. But something else happened: every time I left Sue at the bottom of the steps with her suitcase, a young man passing by would offer to haul her bag to the top. Who were we to argue? After a transfer (and many more stairs and kind assistants) we finally arrived at our stop. I had to get oriented and figure out which way we needed to walk (with our ever-heavier loads) to our hotel next to the Sorbonne. Ten or so minutes later, we dragged ourselves into the lobby of our hotel, and I said exhaustedly to the desk clerk, “Bon Soooir! Monsieur and Madame Collins are checking in.” From the looks on our faces, he could tell. We walked into the lobby about 9:45 pm, a good 90 minutes after returning our car. If we had grabbed a taxi, it would have taken 15 minutes tops. Lesson learned. The Paris metro is no place for people with luggage, no matter how kind and helpful Parisian passersby may be. Which brings us to our second metro adventure. Strictly speaking, this did not take place on the Paris metro system but on the regional rail system known as the RER. The RER has four lines (A, B, C and D) and has many stations throughout the city. You can ride the RER using a regular metro ticket if you stay in the city. RER trains do not run as often as the metro but they still save a lot of walking. We used the RER C to take us to Musee D’Orsay on Sunday, our third full day in Paris. Very convenient — the stop is only steps away from the museum ticket office. After our visit, we had lunch and a glass of wine at the museum restaurant, then headed back to the station to return to our hotel. A train had arrived just as we reached the platform. I looked up at the status screen but couldn’t tell whether this was the train we wanted, and I saw no signs on the exterior or interior of the train that identified it as RER C. I hopped through the doorway of one car to ask the passengers sitting next to the door whether this was in fact the RER C.
Here, dear reader, is where the universe splits. You can read my account or you can read Sue’s account. Then you decide: what would you do? Choose your own adventure. [/raw]Although I was asking “RER C? Is this RER C?” in my best French accent while I gestured to the confines of the train, no one on the train answered — in fact they hardly looked at me. Suddenly the car doors began to close behind me! If there was a warning, I hadn’t heard it. I tried to keep the doors from closing but couldn’t pry them back open. Someone behind me said something about an emergency stop, but I had no idea where that was. The train began to pull away. I looked at Sue through the window with my mouth open, stunned, unable to think of anything to do or say. This is when one of the passengers finally decides to speak to me. “You need to go back,” she says in an accent that was more Spanish than French. She tried to explain something to me, but I couldn’t grasp what she was saying. I got off at the next stop — which was in fact our destination. Call Sue from my cellphone? Not an option. We had decided not to bother with them in France — too much fuss, and after all, who would we call? Here were my thoughts. We had only needed to travel one stop on the RER C. I remember showing Sue, on the map posted in the station, where we were going and telling her we were one stop away. Did she remember? Would she board the next train and meet me here? Sue is smart. What would she do? The last thing I wanted was for us to pass each other on trains heading in opposite directions, trying to meet up. Someone had to move and someone had to stay put. I looked up at the screen and saw that the next train would arrive in about nine minutes, so I waited. Sue was not on it. Maybe she was asking for information. Maybe this train had not stopped at her station. Do all the RER C trains stop at all the stops, or are there “express” trains that skip stops? I didn’t know. And there was no information booth on this platform. I waited a good twenty minutes. The “delayed” train disappeared from the screen and never showed up — where did it go? Finally, another train did pull into the station, but Sue was not on the this one either. I decided I would wait for one more train and, if she was not on it, I would go back to the museum station. That sealed it. I made my way to the opposite platform, found an information booth and asked if they could send a message to my wife at the Musee D’Orsay station that I was on my way. The woman at the information booth was very professional and obliging. Later, as I was waiting at the platform for the return train, she walked up to me and said they located Sue and had relayed my message. [/raw]I looked at Craig and I thought, that is pretty stupid – why is he on the train? He doesn’t even know this is the right one! Then I saw the door close with Craig inside – the look on his face was hilarious. Oh well, I said to myself, this will work out one way or the other. So now I had to figure out what my choices were. First of all, I didn’t know where he was going or whether it was even the right train. And I didn’t know what station I was supposed to go to. I hadn’t been paying attention – Craig was in charge of getting us where we needed to go and I just did what he told me. I looked at the screen for the next train and its arrival time was listed as “indefinite” — so I had no idea when another train was coming. The bottom line is, I didn’t think I could get on another train because I didn’t know what the correct train or station should be. If I were to take a chance and get on the train and then get off at the next stop, and he wasn’t there because it wasn’t the right train or the right stop, then I was stuck. I had no money, just a ticket for the metro. And we would both be on the loose — he wouldn’t know where I was and I still wouldn’t know where he was. As I learned in the Girl Scouts, if you ever get lost, the number-one rule is to stay put and wait for someone to find you. So I just waited and entertained myself by asking various people around me what they would do if they were in the same situation. Pretty much everyone said, I think you’re right, just stay here and he’ll come back for you. I started watching the trains coming in the opposite direction to see if he was returning. I didn’t think he would necessarily be on the first train coming back but I was surprised he was also not on the second. I kept getting up and looking for the train and sitting back down. I sat next to another couple who happened to be from Boston. They told me they were getting off at the next stop and said they would look for Craig if I could tell them what he looked like. They were just ready to board the train so I had to think fast. The first thing that came to mind was, “He is pretty nondescript.” Then I added that he was tall, had wireless glasses, was a little balding, and was wearing a sports shirt and black jeans. I forgot to mention his moustache. A little later as I was waiting, I saw a security person walking directly over to me. She asked, “Did you lose your husband?” and I started laughing. I said, “Yes, I did.” She then said, “He’s on the next train and he’s coming back for you.” So I relaxed, sat down and waited. I was pretty shocked, actually, that it took over an hour for him to come back. At the outset, I figured it would be a half-hour at the most. Readers are invited to share what they would have done (or their own metro stories) in the Comments section. So, what did I learn from this (mis)adventure? • Don’t step on a train that you don’t want to take! • When traveling as a couple, make sure each of you has some money, at least enough for a taxi back to the hotel. • In Paris, each track is dedicated to a single line. Lines do not share tracks. There would have been no other train but the RER C on that platform. I should have read this first. • Furthermore, Paris has no “express” trains. Trains stop at every station they pass. • Finally, I learned that I can still do stupid things even at 60-plus years old. And why I decided to wait for that third train is a mystery even to me. Our helpful concierge told us about the ongoing RER strike when we got back to the hotel. She suggested that we book a shuttle rather than rely on the RER (my original plan) to take us to the airport at the end of our stay. We took her suggestion. Sue noted that she wasn’t the only person at the station who didn’t know what was going on, where to go, or what to do. She thinks that the stations should have help phones on platforms where there is no information booth. That would have been helpful to me too. Rick Steves says: “Travel is exciting and rewarding because it requires you to ad-lib, to be imaginative and spontaneous while encountering and conquering surprise challenges. Make an art out of taking the unexpected in stride.” Easier said than done for this everything-under-control perfectionist. Sue showed much more sang-froid than I did in this situation. We used the metro several more times before we went home, without further incident or uncertainty. Maestros of the Metro. We have seen most of the sights we wanted to see (one exception: the tropical greenhouse at Le Jardin des Plantes was closed yesterday, a disappointment), we have eaten all the duck and pain au raisin that anyone could want, and we have certainly spent more euros than I figured, but at least the credit card hasn’t melted (yet). The USA may have a crappy health care system (as noted by the various Brits we have met along the way) but the price for a typical breakfast in the USA is a bargain compared to what you pay in France. Tonight is our last bistro dinner. We have to get up early in the morning (about midnight North Carolina time) and stuff our stuff back into our suitcases for our 11am flight back to the USA. We have had wonderful weather — no rain except at night. It was a little hot in Sarlat and a little cool and breezy at times here in Paris, but we managed to do without sweaters or jackets. I was thinking of buying a hoodie but held off. Right now I am finishing off the last of the partial bottles of wine we were unable to finish in the restaurant. We have spent down our cash to the last ten or so euros we will need for breakfast at the airport. And I have made the final selection of photos to share with you before we get home. I intend to do a proper digital album of the sights (and sounds) of our adventure when we get back. See you soon. You really didn’t have to go that badly, did you?